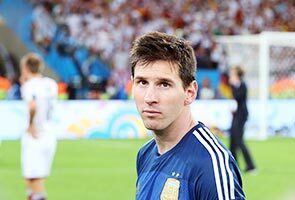 RIO DE JANEIRO: Lionel Messi's failure to win the World Cup with Argentina on Sunday does not affect his status as an all-time great, according to coach Alejandro Sabella. Messi was bidding to emulate his compatriot Diego Maradona by inspiring Argentina to victory in the final in Rio de Janeiro, but instead the four-time world footballer of the year finished on the losing side as Germany prevailed 1-0. The 27-year-old Barcelona superstar squandered a glorious chance early in the second half when he shot wide with only goalkeeper Manuel Neuer to beat, but Sabella said that his captain had nothing to prove. "It is a very demanding tournament and it is drains everyone physically. He is already among the greatest of all time," Sabella said. Despite Argentina's defeat, Messi was awarded the Golden Ball as the tournament's outstanding player, and Sabella felt he was a worthy recipient. "I think yes he deserved it, because he played a great World Cup," said the Argentina coach. "He was a fundamental factor for where we ended up. It was thoroughly deserved." Messi scored four goals in the group phase, including a fine solo goal against Bosnia-Hercegovina and a stunning injury-time winner against Iran, but he failed to find the net in the knockout stage.